Spring for a Pup BIG Adoption Event at Spontaneous Celebrations! « Garment District & LHK9 Adoption Event! 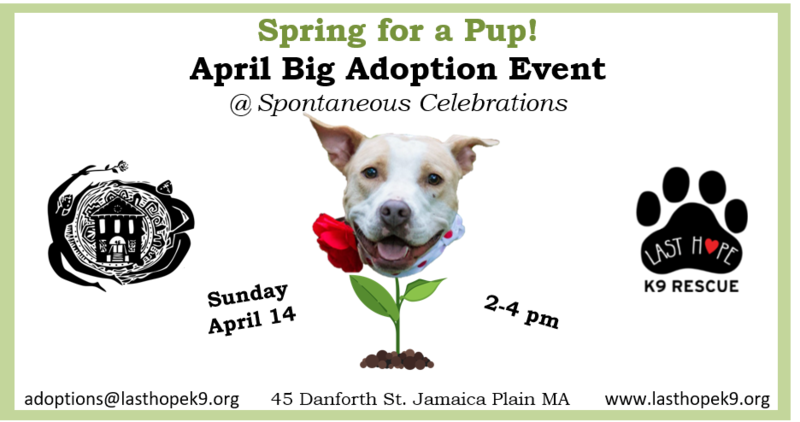 Welcome all to our “Spring for a Pup” BIG adoption event at Spontaneous Celebrations in Jamaica Plain on Sunday April 14! Come meet our adoptable dogs in person, all available for deposits or adoptions! Pre-approved adopters can come early at 1:00, and please remember to bring a leash if you plan to bring a dog home that day! Although there is free parking in the surrounding neighborhood on Sundays, you may want to leave extra time to find a spot or consider taking public transportation to the Stony Brook stop. Spontaneous Celebrations is a three-minute walk from the station.